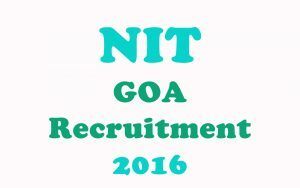 Notification has been issued by NIT Goa in which they have invited applications among Indian Citizens to fill up 10 (ten) Technical Asst, Executive & Other Posts. Executive Engineer: Applicant must possess (i) First class degree or equivalent grade in Engineering (Civil) from a recognized University/ Institute. (ii) 5 years experience in relevant field as Engineer/Asst. Engineer (in PB-3 and GP of Rs 5400/-) from CPWD/State PWD or similar organized services/semi-Govt./PSU/Statutory or Autonomous organization/Universities/reputed institute or organizations under Central/State Govt.